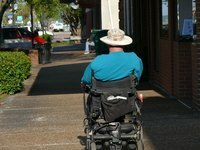 A lot of damage is done to walls by wheelchairs when the walls are too narrow or have a lot of turns. Install wheelchair wall guards to protect your walls from this damage. Wall guards come in a variety of colors that you can match to your decor. Guards also come in various sizes, and they are available in clear plastic, white plastic or aluminum covered in vinyl.